Student reporters on the Balkan Bridges project discuss their relationships to the refugees they covered. "She walked up just like that, we snapped the picture, chatted briefly. Out of everyone I met on that first visit to the Center, out of all the stories and faces of the refugees living there, their never-ending problems and hopes for the future, I couldn’t forget Rohsare. She looked just like any other teenage girl - a bit confused, yet cheerful. Maybe it is because she reminded me of my younger sister, only her childhood had been interrupted. "I had lost a story but gained a friend,"
My thoughts (and heart) remained in Kutina with her. A month later, I went back with only one mission. To find her. I found out that she had been granted asylum and moved away, to Zagreb - but luckily a social worker found her cell phone number, and we started texting each other. "Our conversations were filled with questions like ‘Hey, what’s up?’ or ‘What are you doing?’ rather than the ‘who, what, when, where and why’ they had drilled into us at journalism school. It seemed that whenever I tried to shoot video, something was always wrong with my gear. Eventually I did capture some footage I could work with, and slowly began to lay out the story in my head. Then it happened. Her father stepped in and asked me not to publish any video of Rohsare. I was caught - I didn’t have the courage to try to change his mind, because I didn’t want the family to think I was there just to get their story. That was how it had started, but now things were different. I fell for Rohsare’s raw optimism, her enthusiasm for the future, no matter how hard her journey had been." “We catch up from time to time, but only to keep track on how the other side is doing." "I have quite a soft heart, and I couldn't let my emotions get in the way, cause I would probably burst into tears,"
​There is a triangle between apathetic readers, shallow journalism, and disenfranchised subjects. How can we break down this harmful structure? What do you think about the unchanging portrayal of refugees over time? Why do you think violations of journalistic ethics are a constant? "The ethical code was always there, but no one really wants to follow it, they just consider it as an obstacle or something boring. We actually wanted to remind journalists again about this depository they should use, especially in situations like this." 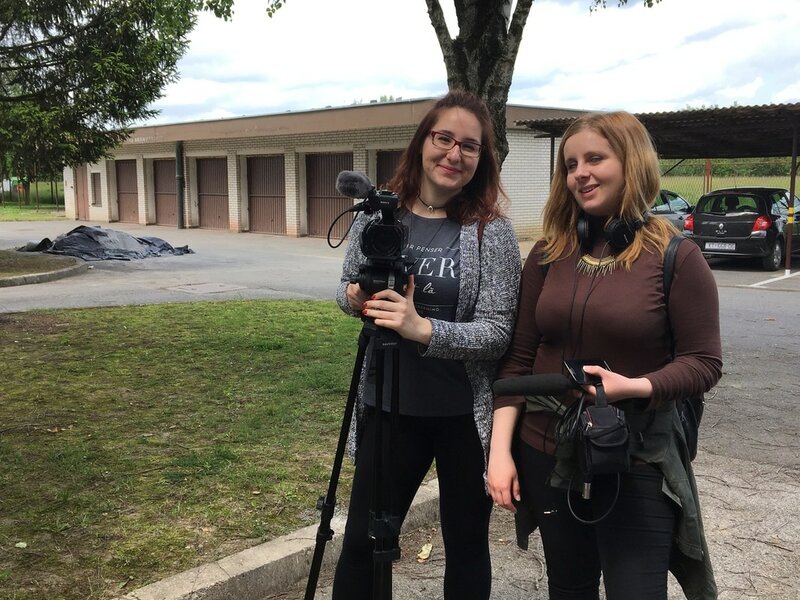 Barbara Ravbar and Petra Srđenović worked on a story about Yolla Ofan, a journalism student from Syria who is currently living in the Kutina Asylum Seekers Center. ​“I managed to keep my distance, but I think the crucial thing that helped me with that was that I was behind the camera. I was the cameraman so I did not have so many opportunities to chat with the girls,” Ravbar said. “I would say that I did get close to the girls but not in a way that could jeopardize my journalistic work. I’m still in contact with Yolla, the journalism student I spoke to, but things didn’t get too personal." "She said to me: 'I will not give you an interview. If you want, come and sit as a friend not as a journalist',"
"The mayor of the city, a Syrian-greek named Dr.Nampil-iosif Morant, had transformed a tourist village into a refugee camp for people from Syria. Inside the camp there were a lot of children, playing in every single street between 38 houses, with their loud voices, full of hope and happiness. At the first door I entered, I found an improvised school for the children, lead by volunteers from 'Schoolbox Project.' I was afraid of just one thing…a sudden break of my camera, because the children weren’t the focus of my camera, but my camera was their focus. I had a great conversation with her, as a friend, without the status of reporter. She used to be very rich in her country, Aleppo. She had been working for a long time in the Central Bank in Syria. She is staying with her children in this camp, while her husband is in Syria and working at one of the government ministries. She said she used to send her children to special schools. She had owned a very beautiful house and cars, which are destroyed now. “I was really excited to go to the refugee center in Kutina, Croatia. There I met Reza, a 16-year-old boy from Iran. You know, he is a runner and he won first and second place in races in Austria. He suffered a lot back in Iran, so it was very difficult for him to speak of the past. During the interview I was trying to be his friend and to encourage him for the future, but it was my job, which didn’t allow me to 'get emotional' with the story or the subject. On the other hand, I was also trying to keep a balance between my job and my human emotions."